Editors: "No bigger album ... in terms of surprise, generosity and controversy"
(CNN) -- Rolling Stone has announced its choice for the best album of 2014. And it may also be the most hated album of 2014. The honor goes to U2's "Songs of Innocence," which annoyed many listeners in September when it was automatically sent to the accounts of 500 million active iTunes users, without their consent, as part of an Apple promotion. Although the album was free, some users grumbled that the distribution method was invasive. 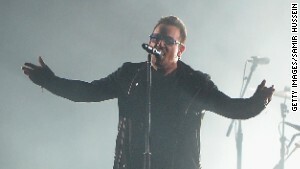 Frontman Bono later apologized, saying the band "got carried away with ourselves." "There was no bigger album of 2014 -- in terms of surprise, generosity and controversy," Rolling Stone's editors said Monday in defending their choice. "Bono, the Edge, Adam Clayton and Larry Mullen Jr. put their lives on the line: giving away 11 songs of guitar rapture and frank, emotional tales of how they became a band out of the rough streets and spiritual ferment of Seventies Dublin." Much of the Internet, however, howled in laughter and protest. "U2 actually just appeared on the Rolling Stone AOTY list and RS didn't know how to delete it," wrote one Twitter user. "In case anyone was wondering if Rolling Stone's opinions on music were still relevant, they named U2's new album the best of the year, so..." said another. Rolling Stone continues to prove their irrelevance, selecting U2 & Bruce Springsteen as the top 2 albums of 2014. Holy hell its not the 80s. Everybody's furious about #U2 being RS's top album of 2014. But you know what? This is why I love @RollingStone, they don't give a damn. As a pop-culture magazine founded in the 1960s, Rolling Stone is often viewed as being less daring in its tastes than online rivals such as Pitchfork, which gave "Songs of Innocence" a 4.6 out of 10. Although U2 remains one of the biggest artists in the world, the band's popularity has slumped over the past decade. "Songs of Innocence" has received little airplay and mixed responses from critics, reflected by its score of 65 out of 100 on Metacritic, which aggregates reviews. In ranking their top 50 albums of the year, Rolling Stone chose U2 over high-profile releases from Bruce Springsteen (#2), The Black Keys (#3), Taylor Swift (#10) and others. Many of 2014's top sellers, including releases by Beyonce, Ed Sheeran and Sam Smith, did not make the list.